Global migration to Canada increased to a tremendous level between the April 1 to July 1, 2018. Throughout this period, the Canada population increased by 168,687 and 82% of this is connected to global migration. As per the Statistics Canada, this international migration level is never seen earlier in any previous quarter. 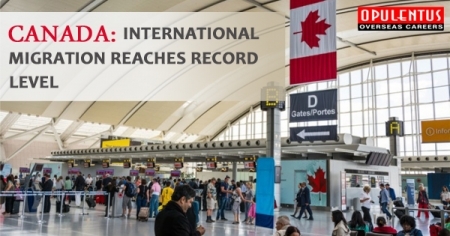 The tremendous level of improvement in global migration to Canada also produced in an overall population growth, the second largest level reported in a three-month time since 1971. Though the general improvement in the population of Canada was in one of the weakest levels in this quarter, it was offset by the rise in levels of migration. The improvement in levels of migration was the principal driver of population increase in most of the provinces in Canada and the Yukon Territory within April 1 and July 1. New Brunswick and Nova Scotia experienced a natural drop in population throughout this period, which was remunerated by the increase in the level of immigration. Canada observed a high number deaths through this quarter. The natural population raise through this period was 29,709. But it did not influence the growth of population owing to the rise in levels of immigration. In the April 1 to July 1, 2018 quarter, Canada received 87,661 new immigrants. Among the provinces, Ontario, Quebec and British Columbia observed a significant rise in the non-permanent resident's number through this quarter.